What Sinister Forces Murdered all of These US Presidents? What Sinister Forces Murdered all of These US President? What happens when a candidate wins the presidential race and gets that first top-level security briefing in the Oval Office? The comedian Bill Hicks had a pretty good idea, which he explained not long after Bill Clinton was inaugurated. "No matter what you promise on the campaign trail," Hicks said in a 1993 routine, "when you win, you go into this smoke-filled room with the 12 industrialist capitalists who got you in there. And you're in this smoky room, and this little film screen comes down, and a big guy with a cigar goes, 'Roll the film.' And it's a shot of the Kennedy assassination from an angle you've never seen before… And then the screen goes up and the lights come up, and they say to the new president, 'Any questions?'" It's hard to find a liberal American who didn't suspect something along these lines after Obama took office four years ago. He has not lived up to any of his campaign promises. The only one that he has passed was Obama Care and he lied to the public about that! At least Republican presidents try to do obnoxious right-wing things like drilling for more oil, Having less regulation for businesses and making government less intrusive in our lives. Democrats like Obama and Clinton seem to be embarrassed by their own supporters. It's the reason why Democrats were so surprised and joyful after Monday's second-term inaugural speech—Obama said liberal things, almost like he believed them! Even without conspiracies and the deepest secrets of the nation, it's not easy to govern from the executive branch. With a Federal Debt that is out of control, entitlement programs running off a cliff and deliberately obstructionist House of Representatives, that seem to want less government and are pro-business, it's almost impossible. Illegal wars and constant drone attacks seem to be the only things the Obama Administration can do with impunity, and those are things Congress would generally approve of anyway, given the chance. Still, a conspiracy is comforting because it explains away some of the disappointment of real life. Obama would stop wars and shut down fracking and make marijuana legal and ensure abortion clinics operated in every state under federal protection, if only those bastards didn't have him by the balls. Play by their rules, or your picture with an intern in a blue dress will make the front page of every newspaper, or your brains get sprayed all over your wife's fancy pink dress. The record isn't very good: Eight presidents have died in office, four by an assassin's gun, four others by illness and even suspected poisoning. Not including those who were successfully killed by assassins, another 13 presidents were the target of failed attempts—of those, Ronald Reagan was repeatedly shot in the chest but survived. One president resigned before he could be impeached. Another two were impeached but remained in office. William Henry Harrison: He served only 31 days in office before dying of pneumonia in 1841. That's what they want you to believe, anyway. Other sources say no less a global superpower than the Illuminati poisoned Harrison, through some remarkably complex arrangement with a Mardi Gras social group called the Mystic Krewe of Comus, which was apparently started as a front group for the Confederacy and Yale's Skull and Bones fraternity. Harrison was killed by these clever racists because he allegedly planned to block the admission of California and Texas to the union as slave-holding states. Zachary Taylor: Harrison wasn't the only one killed off by the pro-slavery Illuminati conspiracy. Zachary Taylor's alleged poisoning was taken seriously enough that his remains were exhumed in 1991, from the National Cemetery in Louisville, and tested for arsenic poisoning. The results were inconclusive, but the suspected reason for his assassination was the same as Harrison's: "because of his opposition to the extension of slavery to Western states." James Garfield was shot by Charles Guiteau in front of many witnesses. 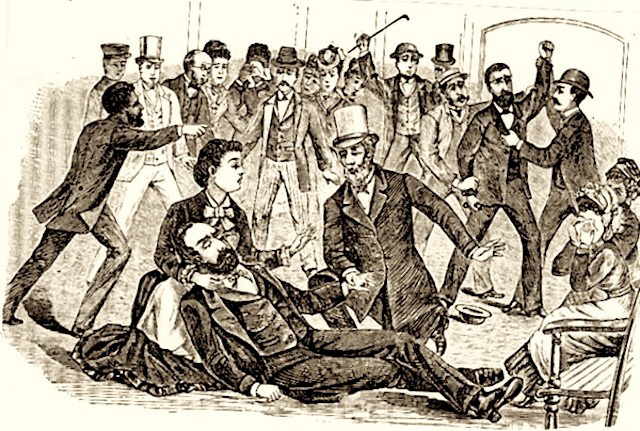 Guiteau shouted as he was wrestled to the ground, "I am a Stalwart of the Stalwarts and Arthur will be President!" Chester A. Arthur, a compromise choice for vice president on the Garfield ticket, was indeed a member of the Stalwarts—an old-fashioned group of bankers and insiders who wished to keep power in Washington. After Garfield died of his wounds just three months after taking the oath of office, Arthur did indeed become president. And the bankers continue to run America. William McKinley was also shot by an assassin in the summer of his second term, on September 6, 1901. An anarchist, Leon Czolgosz, got to McKinley during the president's trip to the World's Fair in Buffalo. Anarchists were commonly blamed for such acts at the turn of the century, because they sometimes committed such crimes. But what was the real reason for the shooting of McKinley within the "Temple of Music" at the Pan-American Exposition in New York State? McKinley's first vice president had died in office, and was replaced for the second term by an ambitious young politician named Theodore Roosevelt, who became a Mason a few months before the shooting in Buffalo, and who would become a very powerful Republican president after McKinley was out of the way. There were also curses and paranormal something-or-others involved, and a mysterious Italian who distracted McKinley's security men at the world's fair! Warren G. Harding died in San Francisco after becoming ill during a tour of the West's best places to drill for oil. He was incredibly corrupt and was best known for the Teapot Dome scandal, which was like 9/11 and Soylndra combined. His wife might've poisoned him, because he constantly had affairs and also took part in crazy pagan orgies. He was also maybe an octoroon, which means he may have been the real first African-American president. After his death, his wife spent a month in the White House destroying all of his personal papers and correspondence.